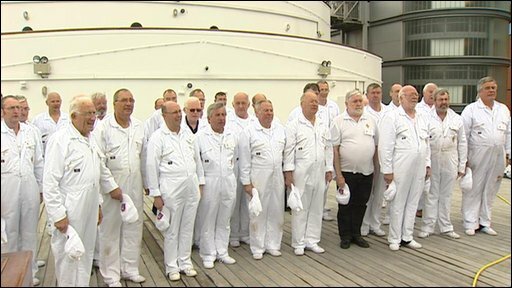 Former crew of the The Royal Yacht Britannia are to return to the ship for a special reunion which will see them in their original jobs for a week. Known as "Yotties", the crew are due to don their overalls and pick up their tools once again to help with the ship's maintenance in Leith. About 50 of the original 240-strong crew, some in their 60s and 70s, start the special week's work on Tuesday. The event marks the 56th anniversary of the yacht's launch from Clydebank. The Yotties will also be on hand to give visitors the chance to hear first-hand experiences of what life was like for the crew when Britannia was in service. The Royal Yacht Britannia served Queen and country for more than 40 years, and has been named Scotland's best visitor attraction by VisitScotland. Since the yacht opened her doors to the public on 19 October 1998, Britannia has welcomed more than 2.9 million visitors. Dave Rushforth, of the Association of Royal Yachtsmen, said the idea for the reunion came from the former crew members. They have an official social get-together every two years but were keen to get back on board to do some work, he said. Mr Rushforth, a former engineer on Britannia, said: "Everybody's doing it because they want to. "We do have a lot of fun and we've all got stories we share. The laughter never stops all day long." 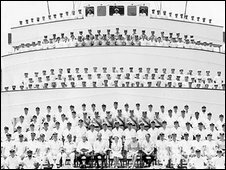 Bob Downie, The Royal Yacht Britannia chief executive, said: "We are looking forward to welcoming back the Yotties to Britannia once again. "This ship holds a very special place in their hearts and it is an incredible opportunity for our visitors to hear their great stories first-hand."